The Actor-TV Host Will Help Bring Awareness to an Often Misdiagnosed Deadly Disease Related to Natalie Cole’s Death. 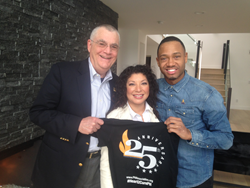 Actor/host Terrence J will serve as celebrity ambassador for the Pulmonary Hypertension Association (PHA) as the national nonprofit celebrates its 25th anniversary in 2016. Terrence J, whose enormous fan base includes nearly 2 million Twitter followers, will help PHA save lives by raising awareness about pulmonary hypertension (PH), an often misdiagnosed deadly disease recently linked to the death of singer Natalie Cole. PH, which affects children and adults, is high blood pressure of the lungs due to narrowing of the pulmonary arteries. The increased pressure forces the right side of the heart to pump so hard to move blood into the lungs that it can lead to death from heart failure. With symptoms that include shortness of breath, fatigue and chest pain, PH too often looks like asthma or other less-threatening illnesses. Because PAH patients go months — sometimes years — believing they have something other than PH, the average length of survival without treatment can be only 2.8 years after diagnosis. Terrence J, who recently left E! News to dedicate more time to his acting career, stars in The Perfect Match (Lionsgate/Codeblack Films), a romantic comedy produced by Queen Latifah and Flavor Unit that hits theaters March 11. His TV and film credits include Think Like a Man, Stomp the Yard, Burlesque, The Game and host of BET’s 106 & Park. He is also author of The Wealth of My Mother’s Wisdom: The Lessons That Made My Life Rich. As PHA’s celebrity ambassador, Terrence J will appear at PHA’s International PH Conference and Scientific Sessions on June 18 in Dallas which is expected to draw more than 2,000 families, medical professionals, scientists and PH-related industry professionals. He will star in a multimedia public service ad campaign that will debut later this year. He will also support PHA in other 25th anniversary awareness efforts. PHA is the first organization in the world dedicated to providing comprehensive PH patient and caregiver support, medical education, specialty care services that improve patients’ quality of life and research to give hope to people battling the disease. For 12 consecutive years, PHA has received the highest rating — four stars — for fiscal accountability and transparency from Charity Navigator, placing it in the top half of one percent of all rated charities. PH can be associated with a number of diseases, among them, lupus, scleroderma, sickle cell anemia and HIV, or it can exist alone with no known cause. Over the past 25 years, as a team of patients, caregivers, clinicians, researchers and volunteers, PHA has seen remarkable progress in patient care, including the growth in FDA-approved treatments from zero to 14, $17 million in PH research commitments, PHA accreditation of more than two dozen pulmonary hypertension care centers across the U.S., and the establishment of a patient registry, which will play a key role in future patient care and science. Headquartered in Silver Spring, Md., with a growing list of chapters across the country, the Pulmonary Hypertension Association (PHA) is the country’s leading pulmonary hypertension organization. Its mission is to extend and improve the lives of those affected by PH; its vision is a world without PH, empowered by hope. PHA achieves this by connecting and working together with the entire PH community of patients, families and medical professionals. Among its programs, PHA facilitates more than 245 support groups around the country and delivers continuing education for medical professionals through PHA Online University. For 12 consecutive years, PHA has received the highest rating — four stars — for fiscal accountability and transparency from Charity Navigator, placing it in the top half of one percent of all rated charities. For more information, please go to http://www.PHAssociation.org, @PHAssociation on Twitter or http://www.facebook.com/PulmonaryHypertensionAssociation.